Colorful visual aids dramatically increase comprehension. 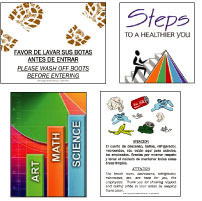 Visual aids can be used in an office or teaching setting. Displays can be made in various sizes and on various materials. The aids can be laminated so you can use dry erase markers to mark them up!